With guide and lead from the marketing areas of each represented laboratory, along with our marketing and medical management, Profármaco elaborates the business and sales plans and looks after the global interests of the represented laboratory represented in each market. Furthermore it offers services in regulatory matters, market studies and in-out negotiation licenses. Profármaco, through its subsidiary companies (Mefasa) in the seven countries of Centra America and Dominican Republic, recruits, hires, trains, motivates, directs, and controls the teams of medical visit that are local or are hosted in each country. Monitors the local distribution through its own branches and/or foreign distributors, suggests and fixes the local sale prices, directs and controls the handling of promotions and sales. Additionally, Profármaco develops a portfolio of licensed products for its promotion and distribution in the region of Central America and the Caribbean, with a pharmaceutical line under the denomination Mefasa Farma and with a network of exclusive medical visitors with an outstanding magnitude in the Central America and the Caribbean area. 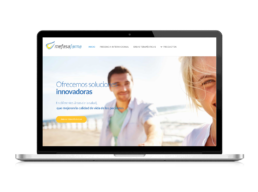 The Mefasa companies (Mercantil Farmacéutica S.A.) are pharmaceutical pharmacies stablished as distributors and with license to act as such, even to have available their own products with sanitary registers or for third parties. It is the affiliate companies of Profarmaco, S.A in the seven countries in Central America and Dominican Republic with wide experience in logistics and distribution. Offering installations, infrastructures, organization, and means of importation, storage, distribution and sale to pharmacies and sanitary institutions. Outstanding laboratories of international level hire the services of Mefasa to be represented and fulfill the tasks and services that guarantee the proper presence of their products in the region. The coverage of the sales network of these affiliates has a significant magnitude, both in their own medical visitors, and salesmen, shaping a human group that is highly specialized in the region and attaining high market penetration for our products. These branches also host and monitor the medical visit teams of Profármaco S.A, just like the other teams from external laboratories. 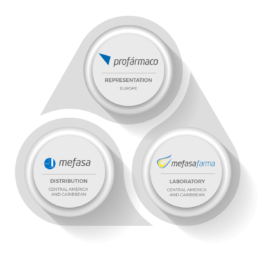 Mefasa Farma is the pharmaceutical laboratory of Grupo Profármaco, which since 1990 seeks and stablishes deals with I+D centers in the international pharmaceutical industry for the commercialization of innovative pharmaceutical products in CAC, either as our own products or under license, with our own pharmaceutical line, named Mefasa Farma. With the goals to always offer innovative pharmaceutical products, with added value, ethics, and safe to use with a very high quality, which contribute to the well-being of the population, we keep contact with important European laboratories and prestigious centers of investigation to keep amplifying our own portfolio. In Mefasa Farma we count with a specialized human group in the commercialization of our products in the Region of Central America and the Caribbean, highly qualified individuals to develop and execute the marketing and sales plans for each one of the products ensuring a high market penetration and place them as leaders in sales. On top of that, the coverage of our own commercial network for these products counts with a highly specialized medical visitor teams and pharmacy promoters which ensure an outstanding presence in the region.